After a rousing SNL performance where he fulfilled the role as host and musical guest, Gambino released the music video for “This Is America,” which was one of the songs he sang onstage. In just over a day, the song has already reached 21 million streams on YouTube and is climbing the charts on Apple Music and Spotify. The song starts off with soothing soul chant vocals that harkens his last two projects Awaken, My Love and Kauai. When Gambino enters the song, he is accompanied by a light-hearted guitar backing and Gambino matches the choir’s tone very nicely. Everything sounds very pleasant and the lyrics about just wanting to party and dance are blissful, but the double-edged sword is that entertainment and wealth distract people from tackling big social issues. Then immediately after the intro, the beat switches into a wonderful concoction of a banger hip hop bass swirled together with these thuddy, tribal African percussion notes that make the song sound visceral and intense. Childish Gambino displays his rapping abilities that brought him to prominence on this beat, which may show a departure from singing-heavy style on his previous work. Gambino’s lyrical ability, while not dependent on quick and speedy flow, still shines through on this track through heady and thoughtful commentary that connects back to the title of the song. He touches on issues such as gun violence, materialism, and racism throughout the song and weaves together a great viewpoint of how these things all plague America. But the song is just the beginning. To get the complete scope, the music video perfectly ties together everything in the song and so much more. The subtleties bring all of the lyrics even more meaning they already had. The study is in regards to selective attention and people are supposed to pay attention to how many basketball passes are being made while completely missing a gorilla that walks right across their screen. Half of the people tested said they did not see the gorilla in the video. That study connects perfectly the hectic music video, where at the same time Gambino and a bunch of schoolchildren are having fun and doing all the new dance crazes, utter chaos is happening in the background. Burning cars and people fleeing police are just some of the Easter eggs that may have been missed in the video. 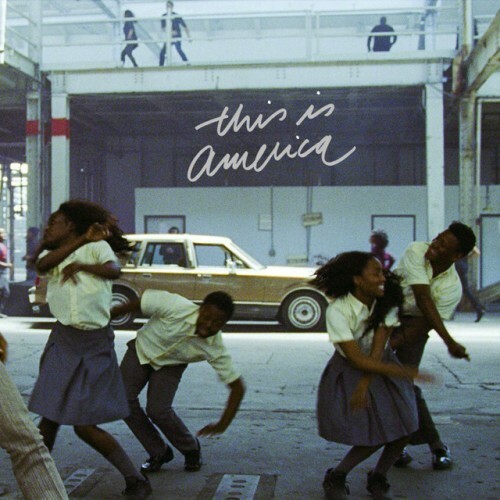 From front to back, both the audio and video, “This is America” is an amazing portrait curated by one of the most prolific and witty entertainers to grace our presence over the years. Childish Gambino just made his biggest statement to date and he did not leave anything to slip through the cracks.